Since ex-TC Oswald devastated our eastern beaches in January 2013 Coastcare has advocated strongly for a Shoreline Erosion Management Plan (SEMP) offering long-term solutions based on expert analysis. The whole-of-island SEMP is scheduled to start in the 2017-18 financial year. This is not to be confused with the draft Coastal Adaption Strategy that Redland City Council sought your opinion on via a recent letter-box drop, web link and public consultation. The draft strategy aims to be an over-arching document offering city-wide prioritisation of identified erosion hazard sites. It claims Coochiemudlo Island has seven of the 44 current hazards. The draft Norfolk Beach Shoreline Erosion Management Plan released by Council in 2014 and finalised as a Study in August 2015 can be accessed in the link in the right hand column – Norfolk Beach Report. There are also six copies in the Coochie library. This 91-page study by consultants, BMT WBM found the eastern shoreline is suffering long-term recession and pinpoints five rocky outcrops or headlands “assisting to control the alignment of the beach.” It says the north-eastern tip or Control Point Five (trees graveyard) appears to have been “out-flanked at some time in the past and Control Point Four, just south is now determining beach alignment in the area.” The report confirms there has been “significant movement of the northern shoreline around Control Point Five”. Coastcare agrees with the experts, as do most locals. This zone is eroding faster than anywhere on the island. 2. The Draft Coastal Adaption Strategy rates its importance as LOW on the Redland City erosion matrix (This isn’t noted on the flyer). 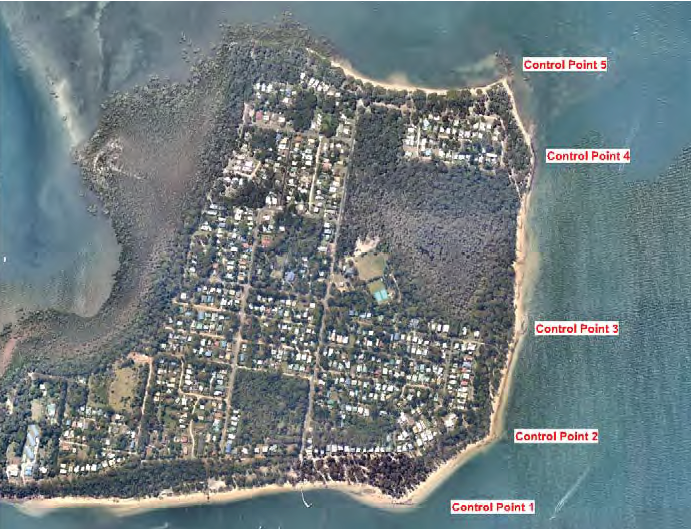 From the outset Coastcare has challenged the priority of works recommended to start at Control Points 1 and 2 (the rocky points at either end of the Outriggers Beach). Consultants claimed if these could be stabilised then Control Points further north “could be subsequently enhanced with the technique and order be determined by recent experience”. The evidence is overwhelming. Control Point 5 (north-east beach and eastern Morwong) urgently needs attention while the Outriggers Beach is healthy and accreting sand. At Morwong Beach east, a mangrove has collapsed and native hibiscus and giant eucalypt have been undercut. We are witnessing what the 2015 study forewarned, “longer-term loss of beach control points resulting in an acceleration of change”. A similar disaster has been temporarily averted at the beach access north of Wetlands (Control Point 4) with the relocation of crushed flood debris and sand from the barge ramp plugging the eroded escarpment. “Uncontrolled overland flows” at Morwong Beach refers to lack of storm water run-off control. It’s hoped recent roads and drainage works have now resolved the issue. 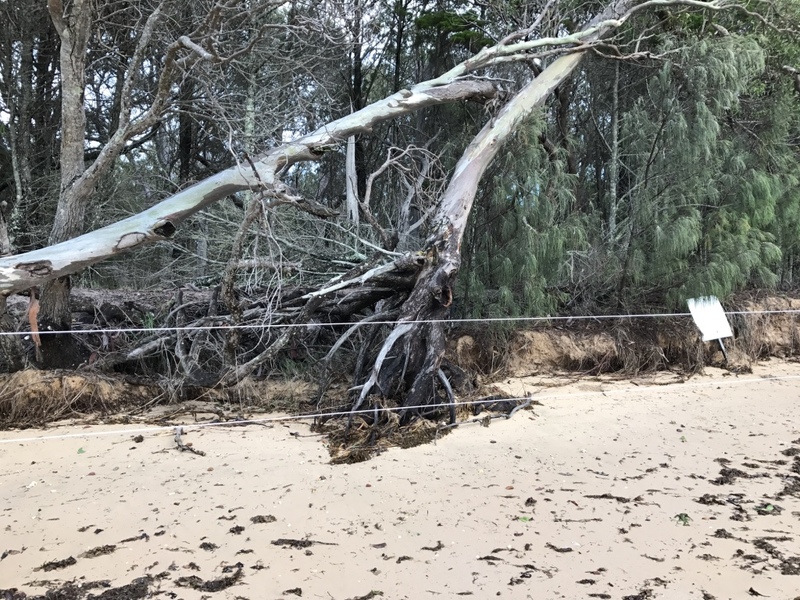 A similar problem exists at Main Beach East where storm-water run-off scours the foreshore exposing tree roots during rain events however Council has recently laid coir logs to arrest the flow. According to the 2015 Erosion Report, Main Beach is considered “stable” with “a small ongoing sand loss to the channel at the west”. The obvious build-up of sand is evidenced on the barge ramp and the almost-buried seat adjacent to the asterisk on Council’s flyer. Again, this beach has been deemed higher priority than the North East with a Medium rating but it’s not noted on the flyer. We wonder why? Coastcare has always sought a SEMP that encompasses the whole island including Red Rock, the golf course, Morwong and Main Beaches. We’re pleased this will finally eventuate as it’s an important step towards preserving our vegetated sandy foreshores for future generations.